Do you envision what’s possible in the future and but more importantly build those skills and ideas to make that future a reality? This is your time. Come and build apps that augment human abilities and experiences. 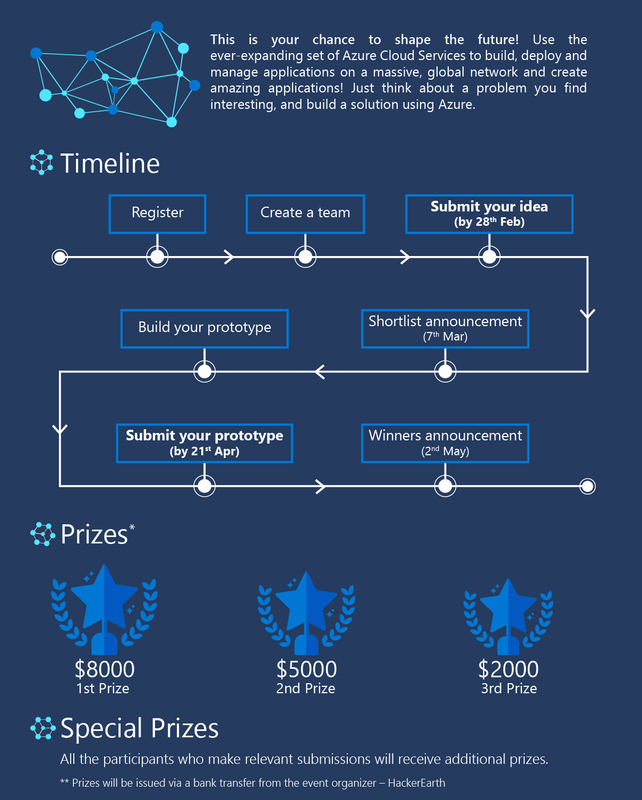 Build an intelligent app using Microsoft AI Cognitive Services, and submit your ideas and projects to win prizes. Watch this space for more on spot quizzes and prizes to be won along the way. Use any language, framework, or platform. Vision API: Image-processing algorithms that smartly identify, caption, index, and moderate your pictures and videos. Speech API: Converts spoken audio into text, use voice for verification, or add speech recognition to your app. Language API: Allows your apps to process natural language with pre-built scripts, evaluate sentiment and learn how to recognize what users want. Want to create a social impact? Translate sign language into an audible experience. Want to improve personal productivity? Identify the user's voice and perform some action like an open door, switch on light etc. Want to improve customer satisfaction? Extract speech from a conversation (audio file) and get the sentiment of the call. You may use voice to text and text analytics APIs here. Think smart traffic police. Identify people are wearing a helmet or not while driving a bike or scooter. Use computer vision / object detection APIs. Faster insurance claims? Detect damage on the vehicle to identify the cost of repair. Health and safety compliance could use the identification of helmets, goggles etc. on people in the vicinity. Simple apps for kids? Build a mobile app for kids to Identify the type of flower or animal. Assist parenting with AI? Maybe computer-assisted content moderation for videos or text. Explore the content moderator API. Usage of messaging apps has surpassed the usage of social media apps. Messaging apps like WhatsApp are exhibiting some of the highest growth in any app category. Your customers are already familiar and engaged with this medium and many prefer to interact with your business through this medium. 45% of consumers claim that they would rather use messaging than email to contact a business and almost 50% preferring messaging using their phones. Offering a channel for them to interact with your brand in a way that they prefer is only logical. Customers want to use messaging to interact with your business and they want communication lines that are open 24/7. Implement a solution for a customer-facing front desk. Your bot should be able to present a default catalog, take and understand user input, and present relevant products based on the query. Computer vision technology is applied to acquire, handle, analyze, and understand digital images and video data from the real world to gain high-level understanding. Computer Vision has its application in vast fields, it covers everything from cancer detection, Security to Traffic management. Implement a solution for traffic management using Azure's cognitive services. Your solution should control traffic by managing street light durations, redirecting traffic, open and closing new lanes etc. Speech has vast implementation in almost every aspect of a business these days. Day-to-day operational tasks can be solved comfortably using speech cognitive services. Implement a service using Azure’s speech cognitive services that will run over a conference bridge. This service directly drops Minutes of Meetings (MoMs), action points, and scheduling next meetings and agenda mail based on the discussion over the conference call.